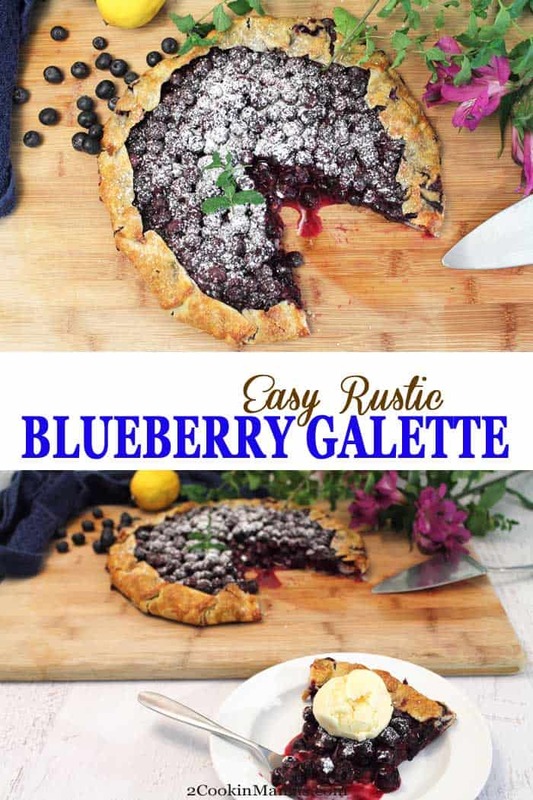 An easy Rustic Blueberry Galette that IS easier than pie! 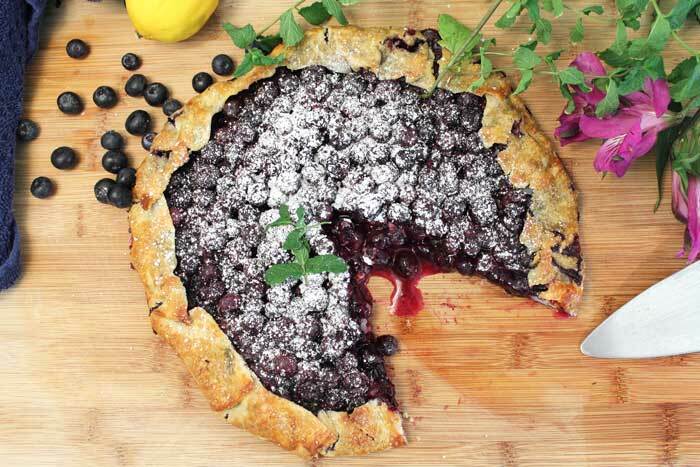 Fresh juicy blueberries, sweetened with sugar & sprinkled with lemon juice, baked into a golden flaky pie crust. The perfect dessert for special occasions or just an everyday treat. This is the first time I have ever tried making a galette. After trying it, I can only wonder what took me so long! They say it’s like if a cake and a pie had a baby, it would definitely be this free-form delectable dessert. And you probably all know that saying “it’s as easy as pie”, well, in this case truer words were never spoken – it’s actually way easier than making a pie. 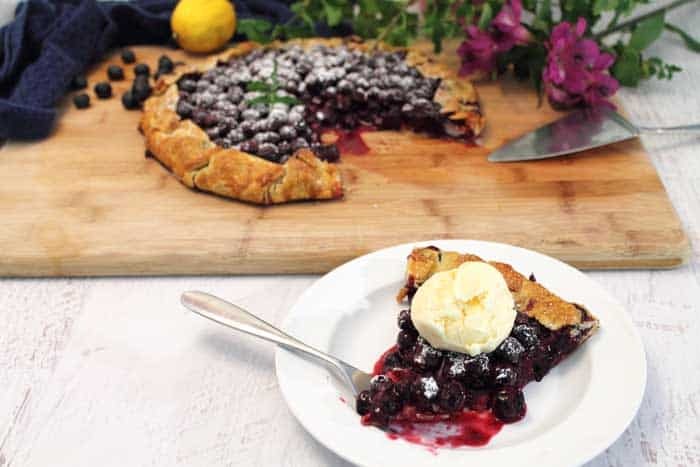 And it comes out as juicy and delicious as a traditional blueberry pie. Why is it easier? 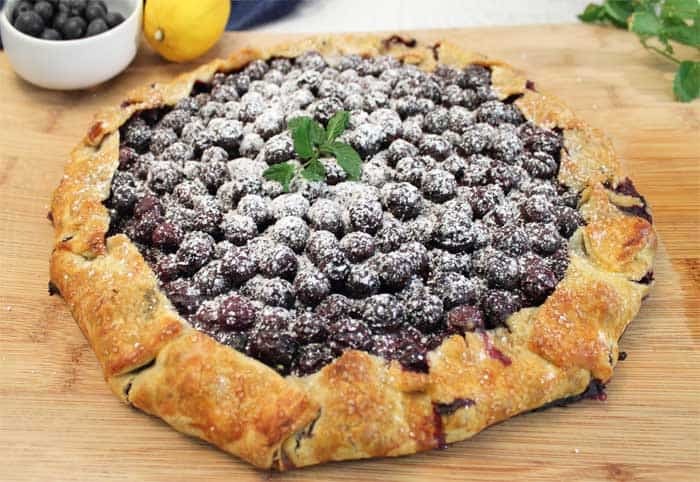 Let me tell you, I think the biggest reason has to be that is is made with just a single crust on the bottom so there is so need to worry about getting the top crust on right or fluting the edges. 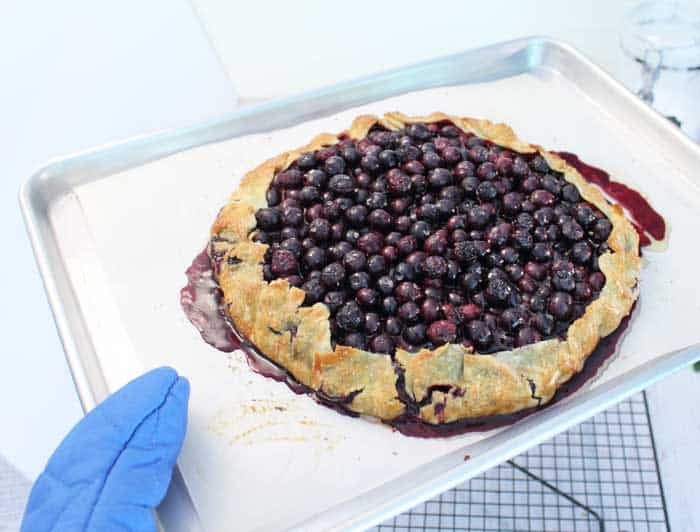 It’s just a free-form dessert that takes just a few simple steps & out comes this beautiful, easy rustic blueberry galette. It’s the perfect dessert for unexpected guests, taking a total of just a little over 30 minutes, 10 minutes to put it together and 25 minutes to bake it, or just because you feel like treating yourself. Just take a look at just how easy it is to make and you’ll be chomping at the bit to make it right away. 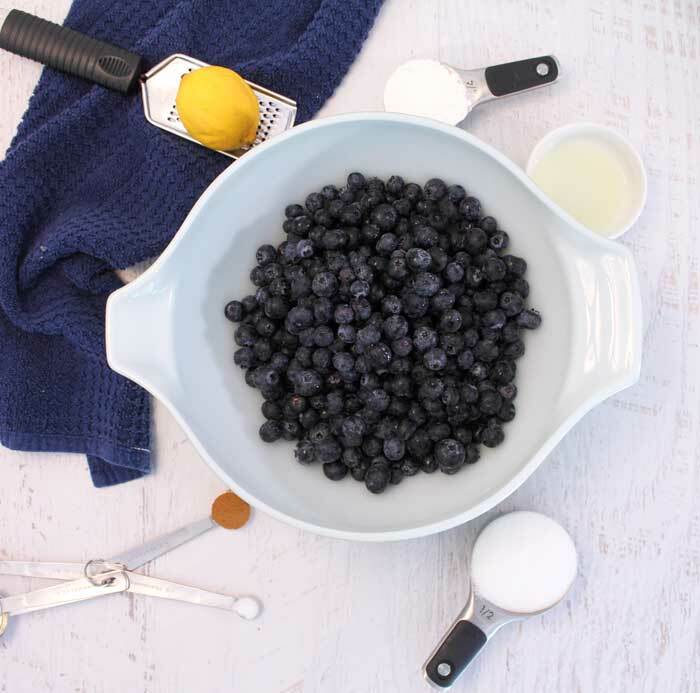 First gather all the ingredients for the blueberry filling – blueberries, a lemon, sugar, cornstarch, salt and cinnamon. Next mix them all together. 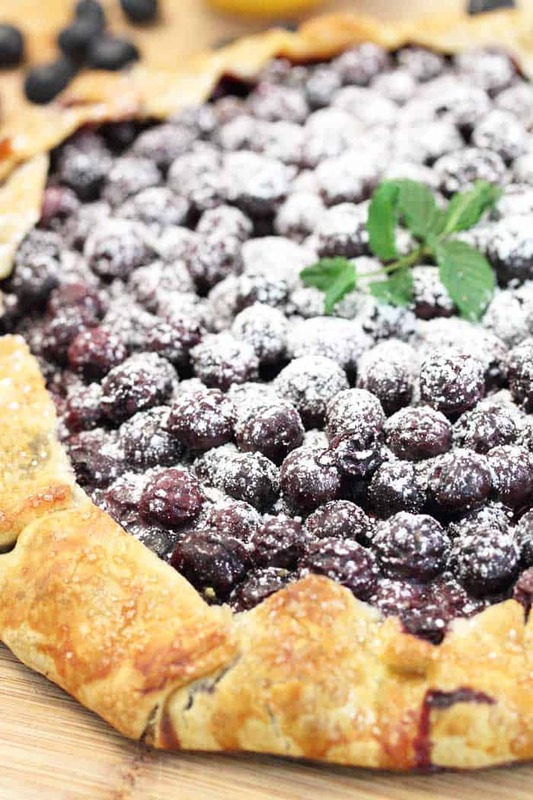 Place a 12″ diameter pie crust on a parchment lined cookie sheet. I use a refrigerated packaged pie crust, rolled out a little thinner, to keep things simple but you could also make your own. Check out our deliciously flaky pie crust here. Pour filling into center, remembering to keep a 1-1/2″ border around edges to fold over. 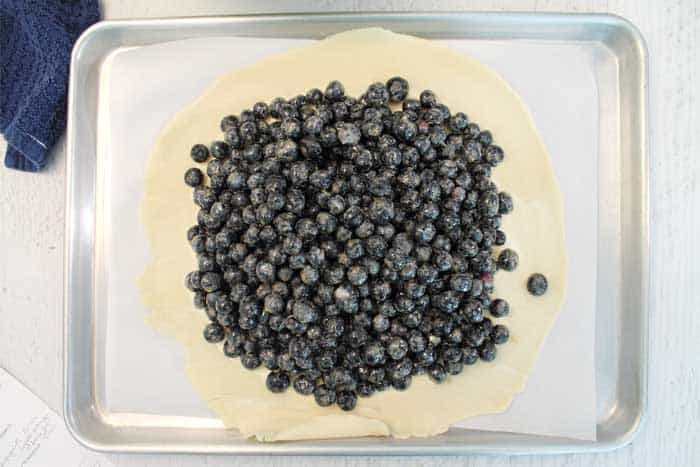 Fold and pleat crust over edge of blueberries. Brush crust with beaten egg and sprinkle generously with Demerara sugar. This coarse sugar gives a nice sweet crunch to the flaky crust. Bake until filling is bubbling and crust is a beautiful golden brown. Dust with powdered sugar and garnish with mint leaves. Now wait until you taste it! 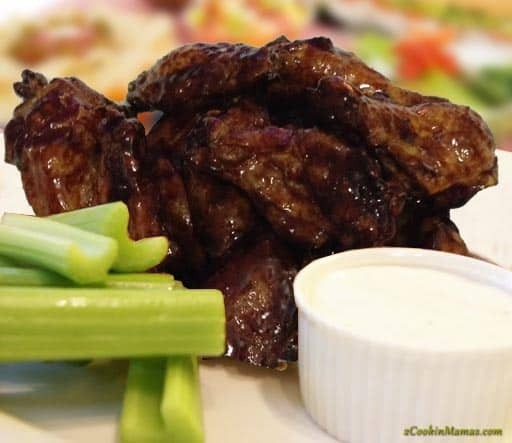 One bite is all you’ll need to know this is one recipe you’ll go back to again and again. 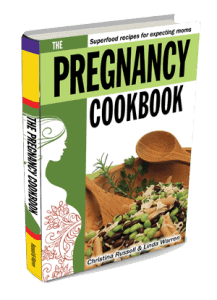 And this recipe is so adaptable. You can make it with any kind of fruit, peaches, apples, strawberries or many savory fillings such as those shown in this Bon Appetit article. I like to top mine with a scoop of vanilla ice cream ’cause as long as I’m having dessert I may as well go all out! It’s simply heavenly! 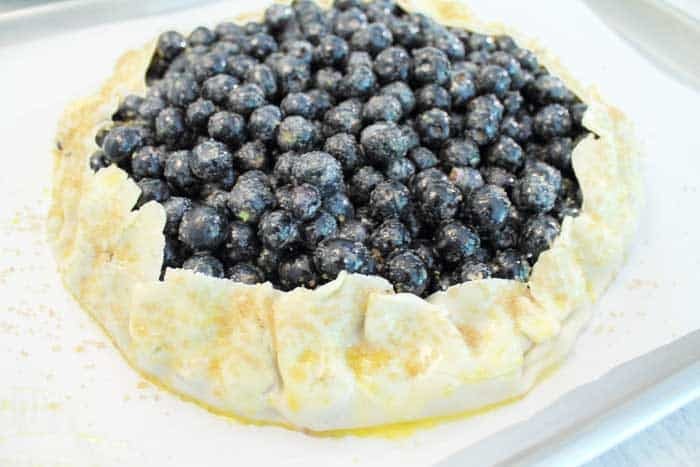 This simple easy rustic blueberry galette is perfect for Mother’s Day, summer BBQs or just whenever. Enjoy! 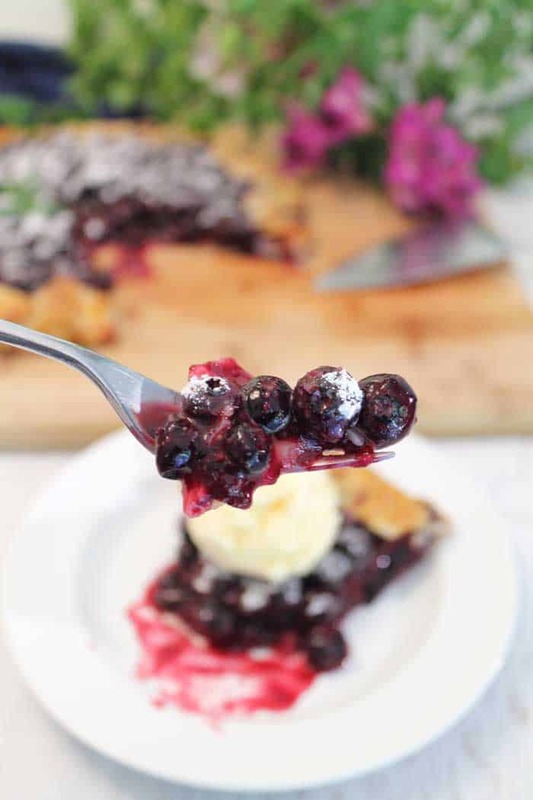 Love blueberries? 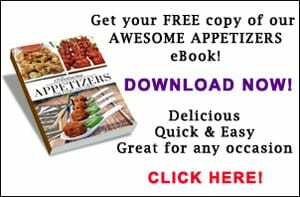 Check out our Lemon Blueberry Doughnuts, Streusel Coffee Cake Blueberry Muffins, healthy Blueberry Crepes and Blueberry Coffee Blast Smoothie. Preheat oven to 425 degrees. Line a large cookie sheet with parchment paper. 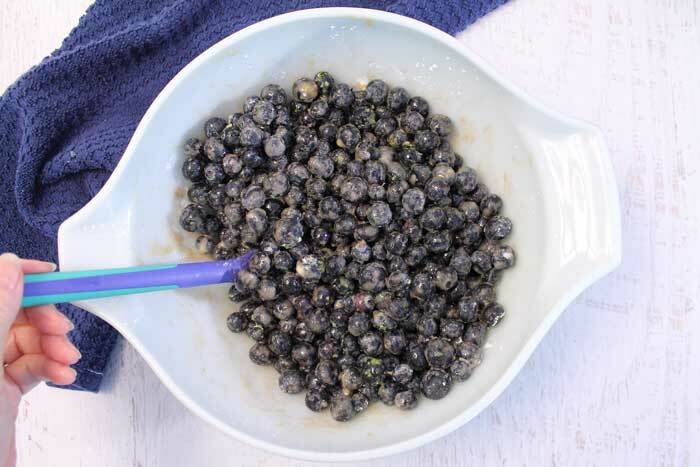 Place blueberries in a large bowl and sprinkle with lemon juice. Toss with sugar, cornstarch, lemon zest, salt and cinnamon. Unroll pie crust, roll to a diameter of 12", and place on prepared cookie sheet. 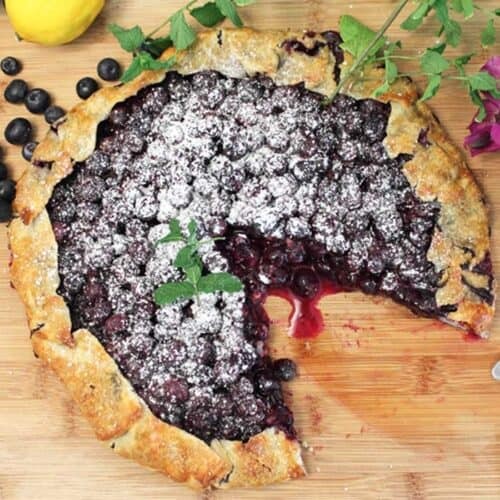 Pour blueberries into center of pie crust and spread out to within 1-1/2" of edges. 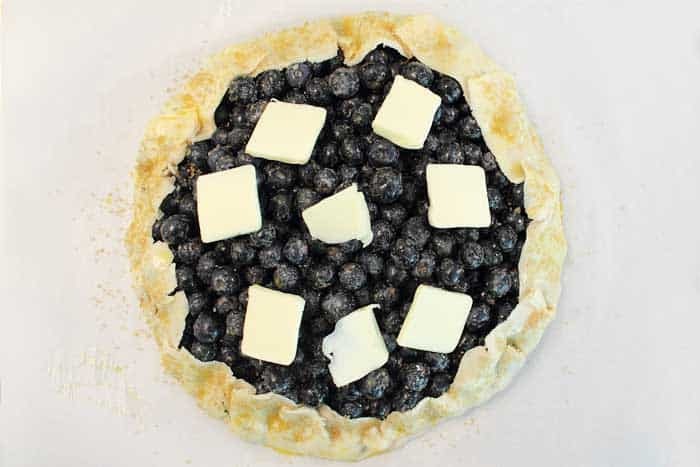 Fold and pleat crust up over edge of blueberries. Using a pastry brush, brush crust with beaten egg. Sprinkle with Demerara sugar or other coarse sugar. Dot blueberries with slices of butter. 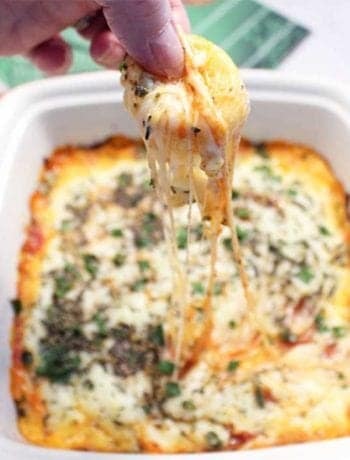 Bake for 25-30 minutes or until crust is golden and center is bubbling. Note: If crust starts to brown too quickly, cover the edge with aluminum foil. Remove from oven and allow to cool on cookie sheet placed on wire rack. Move to serving plate by lifting the parchment paper. You should be able to slide it out once it is on the plate. If not, just cut around the outside and leave under the galette. Garnish with powdered sugar, mint leaves and additional lemon zest. Serve as is or with a scoop of vanilla ice cream. LOVE galettes and blueberry has to be one of my favourites! Perfect for berry season ahead! OH my gosh this is such an amazing dessert! 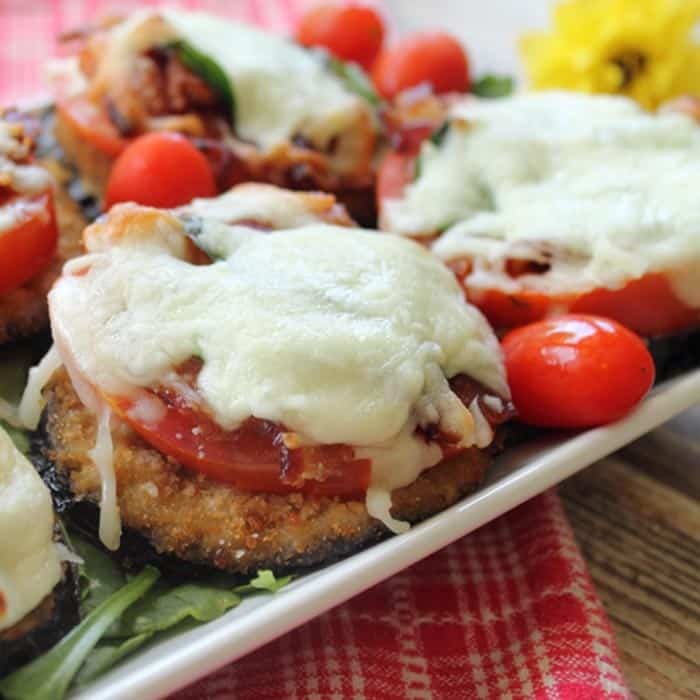 It’s full of fresh flavors and it’s perfect for brunch. 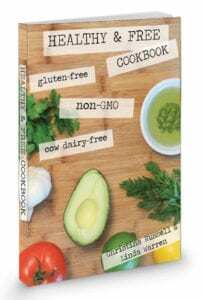 Such a tasty spring/summer recipe! Thanks Meagan! I think it’s perfect for summer picnics and bbqs. So fresh and light.